Does Soy Milk Cause Weight Gain or Helps Lose Weight? Home > Food Facts > Milk & Dairy > Is Soy Milk Fattening or Helps in Losing Weight? Soy milk is made from soaked and grounded soybeans. It is a popular drink among vegetarians and vegans. It is delicious and nutritious. Soy milk is a rich source of proteins, calcium, and other vitamins and minerals. But, is soy milk fattening? Let’s take a closer look. Is Soy Milk Fattening or Not? Is soy milk good for weight loss or does soy milk make you gain weight? The author of The Eat-Clean Diet, Tosca Reno, advises eating soy for weight loss. It is the only complete plant protein that has multiple benefits. Soy milk contains healthy unsaturated fats. A total of 40% of the calories in soy milk comes from fat. Unsaturated fats help lower cholesterol, improve cardiovascular health, and maintain weight. Dairy milk, on the other hand, contains saturated and trans fats which can lead to weight gain. A weight loss diet may result in the loss of essential nutrients, but soy milk is enriched with vitamins and minerals. It contains omega-3 fatty acids, vitamin B, potassium, zinc, and proteins. When you try to lose weight, you burn more muscle than fat. So, the body’s capacity to burn calories decreases. Soy milk helps boost metabolism and lose weight. Soy milk contains fewer calories and sugar compared to cow’s milk. In fact, its calorie content is even lower than that of skim milk. A cup of whole soy milk contains around 80 calories. 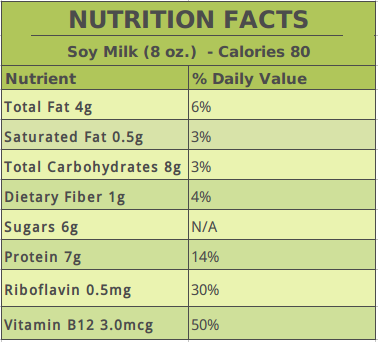 Soy milk provides three grams of dietary fiber which accounts for 12% of the recommended daily intake (RDI). Fiber helps you feel full and avoids overeating. Dairy milk contains 12 grams of sugar while soy milk contains half of that amount. Soy milk contains seven grams of proteins per cup. It is one of the best and complete plant sources of proteins. Soy milk contains 50% of the recommended daily intake of vitamin B12 and 30% of riboflavin. These vitamins help with fatty acid metabolism and energy production. They help to burn fat and lose weight. Soy milk fat content is four grams of fat for a one-cup serving. It contains half a gram of saturated fat and is free of trans fats and cholesterol. Here are three different studies showing the effects of soy milk on weight loss in women. A study published in Journal of the American Dietetic Association found that people who drank 720 milliliters per day of skim milk or soy milk lost a similar amount of weight. Soy milk is beneficial for weight loss just like skim milk. For the study, researchers randomly gave 14 obese women 720 milliliters of skim milk or the same quantity of soy milk for eight weeks. They followed a 500-calorie deﬁcit diet based on their metabolic rate data. Also, they were on an energy-restricted diet. The diet composed of 50 to 60% of carbohydrates, 15 to 20% of protein, and less than 30% total fat. After the eight-week study, researchers found that soy milk and cow’s milk both promote losses in body fat, weight, and abdominal circumference. It preserved fat-free mass. This study also supports the idea that people who wish to lose weight should intake high-dietary calcium from sources like cow milk or soy milk. Post-menopausal women gain weight due to low estrogen levels. This may lead to an increase in weight. In a study presented at Annual Meeting of the Society for the Study of Ingestive Behavior, researchers revealed that a soy-rich diet prevents weight gain in post-menopausal female rats. Soy contains phytoestrogens that act like estrogen and prevent weight gain. In another study published in International Journal of Preventive Medicine, researchers studied the effect of soy milk on 24 overweight and obese female adults who were non-menopausal. The females were randomly chosen to consume a diet of cow’s milk or soy milk. In the four-week study, the women had to consume a diet of soy milk in one trial period, and cow’s milk in another. The participants were on a weight-reducing diet. The researchers found that soy milk helped to reduce waist circumference, but it had no effect on weight, liver enzymes, glycemic control indices, fibrinogen, and blood pressure. The waist circumference reduction may have been due to the phytoestrogen content and proteins in soy milk, which reduces accumulated fats. Soy may cause allergic reactions in some people. It may cause digestive or abdominal discomfort. So, if you are allergic to it, avoid consuming it. Lukaszuk, J.M., et al., “Preliminary Study: Soy Milk as Effective as Skim Milk in Promoting Weight Loss,” Journal of the American Dietetic Association, November 2007; 107(10):1811-1814. doi: 10.1016/j.jada.2007.07.008, last accessed June 19, 2017. 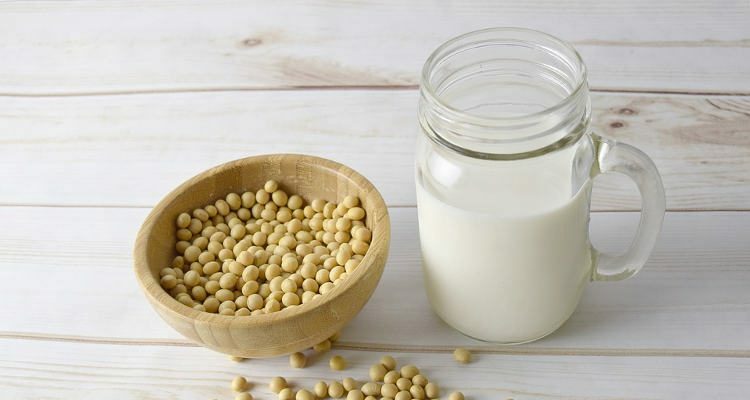 Keshavarz, S.A., et al., “Effect of Soymilk Consumption on Waist Circumference and Cardiovascular Risks among Overweight and Obese Female Adults,” International Journal of Preventative Medicine, November 2012; 3(11): 798-805. https://www.ncbi.nlm.nih.gov/pmc/articles/PMC3506092/, last accessed June 19, 2017. “Is Soy Milk Fattening?” SFGate; http://healthyeating.sfgate.com/soy-milk-fattening-2271.html, last accessed June 19, 2017.